American Airlines (Dallas/Fort Worth) is getting ready to introduce a new livery, probably now with some fuselage paint (at least for the 787s) and the new look is likely be introduced with the new Boeing 777-323 ERs on order which will usher in a large fleet overhaul. As we have been suggesting, it is time for a refresh after 44 years and the Chapter 11 reorganization process. The time is right for a new image. According to this article by the Wall Street Journal and several previous hints by AA management, a new brand is being developed. As the article states, the upcoming Boeing 787 Dreamliners, made of composite materials, are also forcing the issue to replace the all-metal “Silver Fleet”. The Dreamliners need fuselage paint. Will AA use a metallic silver paint to cover the 787s? 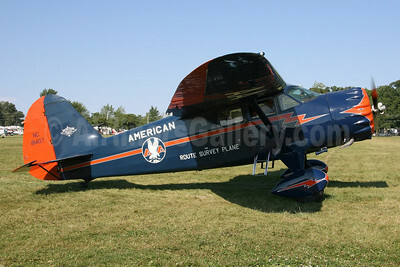 American has for a long time, adopted the polished metal fuselage finish with just decorative paint on the fuselage. Top Copyright Photo: Bruce Drum. When the Airbus A300B4-605R aircraft were first delivered to American in the 1968 livery, the fuselage was painted in this gray fuselage color to make it blend in with the all metal fleet. Airbus had recommended to the airline that it should paint the A300 fuselages. 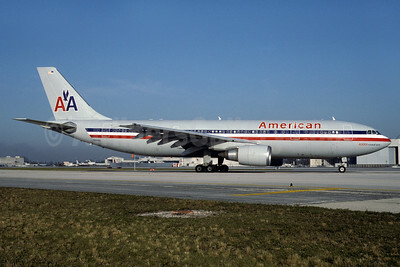 AA later found a way lto operate the A300s in the traditional bare metal finish. N18066 (msn 509) taxies to the runway at the Miami hub. Bottom Copyright Photo: Wingnut. American in its early years as American Airways liked much bolder fuselage paint for its aircraft. A repainted and restored Stinson SRC-9C Reliant NC18407 (msn 5313) shows off the 1933 lightning bolt livery at Oshkosh. Will it return to a bolder look? This entry was posted in American Airlines and tagged 509, 5313, A300, A300600, A300B4605R, Airbus, Airbus A300, Airbus A300600, Airbus A300B4, Airbus A300B4605R, American Airlines, American Airways, aviation, chapter 11 reorganization, MIA, Miami, N18066, NC18407, OSH, Oshkosh, silver fleet, SRC9C, SRC9C Reliant, Stinson, Stinson Reliant, Stinson SRC9C Reliant, transportation on July 25, 2012 by Bruce Drum. EAA AirVenture Oshkosh (Oshkosh) yesterday (July 26) welcomed 21 Douglas DC-3s in a massive arrival formation to the annual air show. More DC-3s are expected this week. The event is celebrating the 75th Anniversary of the DC-3. Copyright Photo: Greg Drawbaugh. Thunderbird Flying Service DC-3A-S1C3G NC43XX (msn 11665) lands at OSH. This entry was posted in Thunderbird Flying Service and tagged 11665, DC-3, DC-3A, DC-3A-S1C3G, Douglas, Douglas DC-3, EAA AirVenture, Greg Drawbaugh, NC43XX, OSH, Oshkosh, Thunderbird Flying Service on July 27, 2010 by Bruce Drum.